Summer's on its way, and when better to experience the chic and charming cool of Helsinki? Summer's on its way, and when better to experience the chic and charming cool of Helsinki? 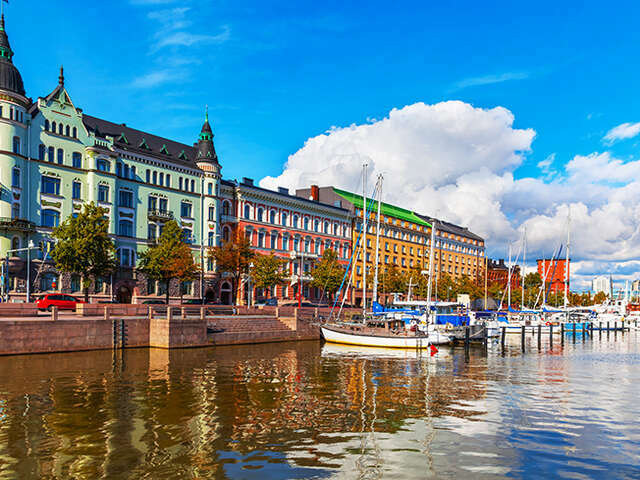 Finland's capital and largest city with just over a million people, Helsinki garners rave reviews for its lovely architecture, outstanding design scene, quirky bars and restaurants, and of course, sauna culture (but more about that later). Helsinki is a city made for strolling. Located on a network of over 300 islands, over a third of the town is devoted to parkland. And with long summer daylight hours, there's more time to explore. Mingle with the locals at the massive Market Square where dozens of stalls brimming with fresh flowers and fruit, snacks and souvenirs. Perhaps stop at a cafe - after all, you are in the coffee capital of the world! Admire the art deco and modern, striking buildings of Finnish architects Alvar Allto and Eliel Saarinen. You'll want to drop by the cavernous Temppeliaukia Rock Church, built right into the rock the city sits on. Helsinki is renowned as a major design centre, and guided walking tours are offered of the bohemian Design District. A must-see is the 140 year old Design Museum showcasing applied art and design from kitchen appliances to fashion to furniture. A very Finnish souvenir would be an item of clothing from Finnish design house Marimekko, famed for its bright primitive colours. fashion is big business here and you can find everything from timeless elegance to outright quirky outfits bursting with personality. Like their fellow Scandinavians, everything Finnish designers put their hands to seems to come up original, unusual and utterly charming.